A job used to be for life: 30 years or more of dedicated service, in the same career, doing the same thing – day in, day out. And that’s what we wanted: Salary enough to support a family, and savings for retirement – somehow beginning our lives at the end. But today there is inflexibility in this method. In the modern workplace, no one skill is enough to keep you relevant (and in demand) forever. Last weekend I met up with a friend, who runs a small department in a well-known national charity. We often talk together about the challenges of modern management, running efficient teams and people-based challenges. We chat over coffee about all aspects of team management and leadership: Recruitment techniques, training and motivating staff, as well as dealing with difficult employees. I was blindsided. It’s amazing how sometimes the most simple questions can be the hardest to answer. I heard myself give vague, waffley, nonsensical answers about the ‘multitude of skills needed in the modern workforce’, the ‘importance of being flexible’ and how ‘cognitive diversity is a driving factor’. Feeling my answers (and confidence!) slip away, I grasped at how ‘motivation and enthusiasm’ were the key factors I’d look for in complementing my team. My friend tried to hide his smile. To be fair, if someone had given me an answer as bad as that in a job interview I wouldn’t have invited them back. As manager of the Innovation team at a rapidly growing tech company, the future of work is a topic I’m very familiar with. By changing the nature of the original question, I realised this was something I knew the answer to. All of the things I had mentioned to my friend were undeniably important, but I knew there was a piece of the jigsaw missing. An article on Keeping Up with the Future of Work by Stephane Kasriel (CEO of Upwork) confirmed my thoughts. In it, he discusses the Importance of of reskilling. This was the missing piece, the one thing that connected all the factors I deemed important in my initial answer. Put simply, reskilling is the ongoing process of developing your own skills. And that is when the answer to my friend’s original question hit me. For me, the key thing I look for in a new employee is their attitude. I could argue that everyone who is working will be constantly improving their skills. But, in order to be skilled at reskilling, a person must be able to recognise their own shortcomings, knowledge gaps and preferential working styles. 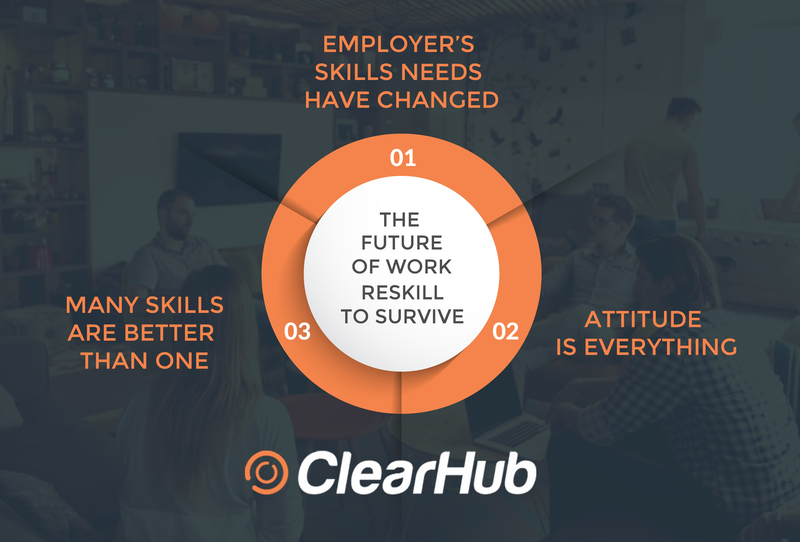 You must have the right attitude to allow reskilling to work. Having the right attitude and your approach to reskilling are potentially the largest factors to determine your success. We all need to be able to ask difficult questions about our skills, such as “Are they still in demand?”, “Will they be in demand in 5,10,20 years time?” and “What other skills should I be looking at to increase my value?”. Being driven and proactive enough to take responsibility for your own learning – and flexible enough to make a changes where necessary is critical in life. It’s no good waiting for disruption to catch up with you before you realise you need to evolve. No matter if you’re talking about contractors, full time employees, interns or CEOs, I would argue that knowing how to reskill and upskill yourself and working to make sure you have the right attitude is going to become the most powerful combination you can possess for surviving in the future. It also guarantees you as a future investment. The top thing needed to succeed in the future is the skill of reskilling – with the right attitude. After all, an employee who is willing to invest time and training into themselves will continue to be a credit to their employer: Now and in the future. What is the one thing that you look for when hiring a new employee?